The Microbatch Kit is used to inject samples directly into the flow cell of a DAWN or miniDAWN MALS detector in stop-flow mode. This technique requires a minimum volume of 300 µL with standard MALS detectors. In addition, the Microbatch Kit can be used for Zimm Plots, Optilab RI calibration and dn/dc determination. The kit includes finger-tight, 10-32 coned PEEK fittings; PEEK tubing .01" (0.25 mm) i.d. ; a coned 10-32/Luer Adaptor, disposable 10 mL syringes; 0.02 µm filters, and 0.2 µm filters. 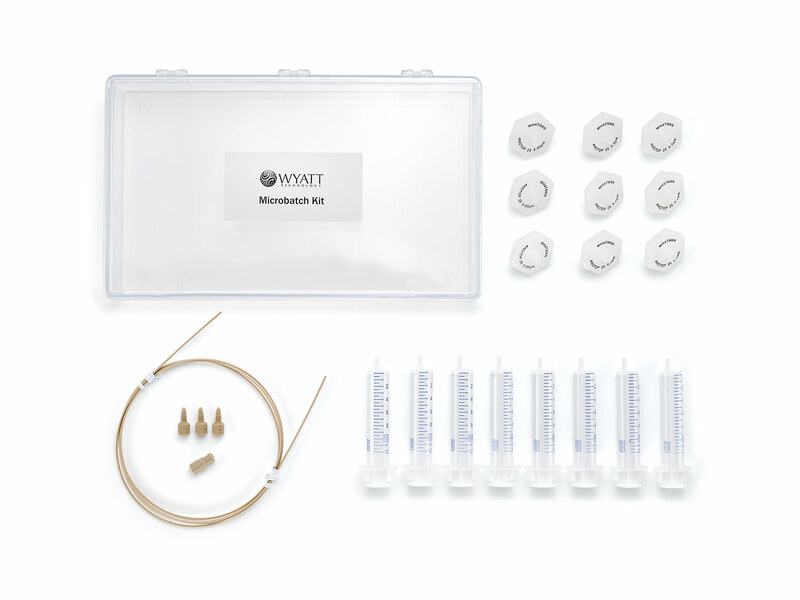 If you are a current US or Canadian Wyatt Technology customer, you can purchase the Microbatch Kit online. Visit the Wyatt Technology Store today!